Speak, Show and Tell...with author A. K. Buckroth | Inclusive of Diabetes Awarenes for the General Public. From birthing thoughts, jotting ideas, typing a manuscript, carrying a daily journal, contacting an illustrator, building the manuscript, proofreading and editing again and again and again and…you get the idea…this dream came to fruition. It had do be done. There is no other book like it — as far as my research goes — that reflects, mimics, or encourages diabetic children, T1Ds. The book is now available to the general public in paperback form. Celebrate!! Submitting to a marketable world with a targeted audience, networking, promoting, speaking, through the main character, Kali with her dog, Money, brings attention to the increase of diabetes in animals – up 300% this past decade! Through the wonderful insightfulness of illustrator Amy Pichly-Meyer who is responsible for the clarity of expression with the cover design, along with all 37 colored illustrations, this book was built for you. I am thankful for her friendship and abilities. Briefly, the main character, Kali, is presently a fourth grader. She was diagnosed with diabetes at the age of two. Her rapid growth with blooming and wizened independence results from learning how to take care of herself. Wayne, a best friend, knows her very well and together they embark on adventures through Wayne’s hobby, their separate and shared responsibilities, mutual friends, and more. But Kali cannot forget her special pack! She must carry this with her everyday, everywhere. Due to keeping up with my chores, I occasionally have some change in my pocket. That’s because my parents give me a weekly allowance that I can spend when I want. “Make sure you spend wisely,’ Dad says. I’m not quite sure what “spend wisely” means, but I think I do okay with what I have. For instance, one of my friends from school, Wayne, asked me to go to the hobby store one Saturday afternoon. Because it is school summer vacation time, we could go almost any time, depending on our parents. However, Saturday’s are best. Wayne and I go way back, to kindergarten. He is the only red-head kid in our whole grammar school, never mind our fourth grade. He’s a full blown carrot top with thick hair in wavy curls. This makes him real easy to spot in a crowd. The girls in our class like Wayne more than the boys do. I think this is because he has good manners and is polite. It is either that or his clear sky blue eyes that sparkle. Even his eyelashes are orange, matching his hair. Most girls I know like blue eyes. I never thought about it much. My eyes are dark brown to match my light brown and blonde streaky hair. Wayne is a pale looking kid. Most of the time, the only color on Wayne’s face is because of his tannish-brown colored freckles. I swear, if he didn’t have freckles, he would be white as a ghost! I tease him about that, pretending that I can’t see him sometimes. We laugh. He blushes all red and pink. It’s funny to see. Wayne is shorter than I am — for now. He teases me about my long brown hair — so flat, so straight and thin. “There’s nothing to your hair,” he tells me as he quickly flicks it in the air. “You don’t even have to brush it. Your hair just hangs there off your fat head,” he often tells me as if I need to be reminded. I think Wayne is jealous of my straight hair. Brushing his hair is a struggle because it is very thick. Mine is a lot easier because it is stick straight. He hates when his mother brushes his hair because “she always pulls it out of my head,” he told me one time. “And you have a chubby little pug-nose. Not like my pointy one at all,” he compares. “But you get a tan in the summer. I don’t tan, I burn. It’s awful,” he explains. That is true. One summer that I remember, his mother covered his face and arms with white suntan lotion so he wouldn’t get burned while playing with me in my back yard. He looked so funny. That stuff made him smell like the beach. I laughed at him. He didn’t like that. And after a while, the suntan lotion disappeared. But we stayed friends. He wears that stuff all the time. Sure, I use it too, but when I forget to rub it on my skin, I don’t get too worried. “I guess you look like your father,” I told him because I think he does. “I look like my mother,” I said. And that’s okay with me because my mother is beautiful. My Dad’s okay looking — for a Dad. Sometimes he has a moustache. Mom told him to shave it off because it made her sneeze when they kiss. Eeeuu! Sneezing and kissing, yuck! “Okay. Thanks. I’ll get it up here,” I told her. Well, I have no particular interest in model trains, so I knew I wouldn’t buy anything but I would go along with him anyway. This is a wise decision. After all, he is my very best friend. Very best friends do things for each other whether we need to or like to or not. It was Saturday morning anyway. Cleaning my room could wait until I got back. I was thinking, planning. “I don’t mind. Is your room picked up?” Mom asked. “I think we’ll walk.” And out the back door I went. Wayne lives four houses away from me. I took the short-cut over to his house through a wildflower field. I often come here to pick my mother some flowers. I like to pick flowers for her. There are all kinds of wildflowers in this field: yellow ones, pink ones, purple ones with yellow centers. I don’t know the names of these flowers, I just know they are pretty and Mom likes them. After I met Wayne on the front porch of his house, we proceeded to walk to this particular ‘train store’ as he calls it. It is really a hobby store that has lots of other things of interest besides trains. I’ve been in there with one of my older cousins. She was looking for some particular, special types of paint brushes made with camel’s hair. I thought that was cool — paint brushes made out of a camel’s hair! There are small glider planes in this store with hand-held motor devices; there are different kinds of wood burners and wood carving tools; there are even lots of different colored rubber fish bait things — lures. I liked those because they are shiny, squishy, and they squiggle. Things that would attract a fish — go figure! Wayne had been going on about a certain model train engine he saw in here a while ago. It took him weeks and weeks to save up his allowance money to buy it. “Yes, it’s fine. I filled it up with insulin yesterday morning and changed the needle site. We are good to go!” I planned this on purpose. I knew he would ask. I am diabetic. Wayne knows. Among many other things, I do take care of myself and my diabetes. I have to test my blood sugar levels many times each day. Diabetes is a disease that causes me not to digest food properly. Because of that, I wear an insulin pump. I used to have to take insulin shots before I got the pump. Having the pump is much easier. An insulin pump squirts insulin into my body, automatically, a tiny bit at a time. A “squirt” is maybe the size of a pencil tip or the size of a period at the end of a sentence. My parents had to give me insulin shots before I learned to give them myself. I still keep syringes handy, in case the pump breaks down for whatever reason. This is called having “Plan B” which is important. 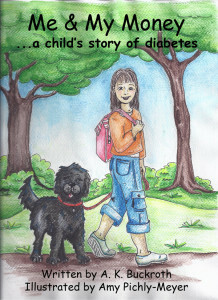 Read more of Kali’s young life with diabetes in “Me & My Money…a child’s story of diabetes.” Available at Amazon.com. 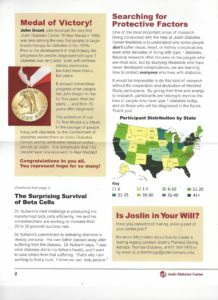 Yes, an astounding 50-Year celebration with the few people that have lived courageously and successfully with diabetes. By ‘few,’ I mean approximately 6,153 since 1970. 1970. Phew. That’s six thousand, one hundred and fifty three individual characters in 50 years. 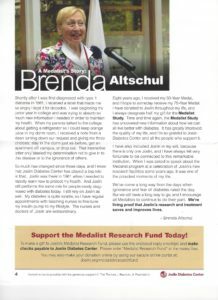 Having been a recipient of this particular medal in 2010, I am glad to report that I have lived another 10 years with diabetes. Let me tell you…it has not been easy. Whew. In order for me to receive a 75-year medal, self-discipline is a nurtured core value. It is hard to have diabetes,even when I have an insulin pump. My blood sugars will vary every day and there is no such thing as “control” with Type 1. Please be patient while I deal with low and high blood sugars. I wear super cool gadgets that help keep me alive. My insulin pump and/or continuous glucose monitor may look like the latest ipod or mobile phone – some alarms even sound like a ring tone. Please don’t take them away from me – you would be putting my health in danger. Sometimes I need to eat in class I need to keep glucose tabs and snacks in my desk (or pockets) in case of emergency. If go low, even a trip to the nurse’s office could be too risky without immediate fast acting sugar, I may not be brave enough to speak up for myself. I depend on you to put my health and well being first. It’s not always easy to speak up when I’m low or high and need to take care of diabetes. It helps to know you’re looking out for my best interests. I need immediate attention when I tell you I feel low, I may also need your help. Please give me a snack or let me check my blood sugar immediately. Don’t leave me alone or send me to the nurse’s office by myself. My body and brain won’t be functioning properly and I could make a wrong turn or collapse in the hallway. I also cannot finish a test or complete my work until I have treated my low. When my blood sugar is high, I use the restroom frequently. This will not change, no matter how old I get. Please be patient when I need to take multiple restroom breaks throughout the day. This typically means my blood sugar is high and my body is reacting normally to flush extra glucose. When my blood sugar is high, I also need to drink more to help it go down. Please don’t call me diabetic because I am defined by WHO I am, not by diabetes. If I’m not listening well or following instructions, I may need to check my blood sugar. Please don’t assume that my lack of obedience or cooperation has anything to do with my attitude. If you notice I’m not paying attention or am acting odd, gently ask me to check my blood sugar. Thank you for being patient with interruptions in class. Checking blood sugar multiple times a day, adjusting insulin levels and treating lows or highs can be exhausting. Your compassion during these interruptions will help make school easier for me so that I don’t feel like a burden to you or the class. Some days are a roller coaster of highs and lows. Days that include low and high blood sugars happen. And when they do, I may feel terrible. It’s similar to how you feel when you have the flu or have had too much alcohol. March 8, 2019 by Brett Holzhauer with www.diabetesforecast.org. Los Angeles International Airport (LAX) Each terminal has at least one wheelchair accessible restroom. All parking facilities have designated handicap parking stalls. Requesting a Wheelchair To Request wheelchair service, it is recommended you contact your airline 72 hours in advance. Wheelchair service is provide free of charge by your airline. Tipping is not required for wheelchair service. Most individuals requesting wheelchair assistance are transported via wheelchair from ticketing to their aircraft. Airlines are required to provide curbside wheelchair service when requested. On your return flight, you should remind a flight attendant near the end of your flight, that you will need a wheelchair upon arrival. Curbside Each airline is responsible for providing wheelchairs for their customers with disabilities, from curbside drop-off to the aircraft. Contact your airline’s reservation desk a minimum of 72 hours prior to your flight to reserve wheelchair service. Wheelchair service is provided free of charge. Tipping is not required. From Parking Structure Airlines are not responsible for providing wheelchair service from parking structures to terminals. Phoenix Sky Harbor International Airport (PHX) Each terminal has at least one family restroom with a private area to change clothing or disposable undergarments. Ask for directions at any information desk. Accessible parking is available in all garages closest to the elevators. In the East Economy lot, accessible parking is available north of the PHX Sky Train Station. In the West Economy Park & Walk, accessible parking is available at the east end closest to Terminal 2. If you need extra time at the curb, Airport staff on the curb may issue Special Needs permits. Over height or oversize parking is available in the uncovered economy parking areas and Oversized Vehicle parking area east of Terminal 4. Request a wheelchair when checking in and tell a flight attendant during the flight. If you are departing, you may request a wheelchair from a Sky Cap at the curb or from a Sky Cap or the airline on the ticketing level of the terminal. You can also request wheelchair service ahead of time when you book your tickets with your airline. Ask your airline about traveling with power chair batteries. San Francisco International Airport (SFO) Companion Care Restrooms for travelers needing companion assistance are located in all terminals, pre-security and post-security. All airport parking facilities have convenient parking for vehicles displaying a: DP (Disabled Person) license plate DV (Disabled Veteran) license plate Disabled Parking placard The Domestic Garage has standard parking at all levels. Van accessible parking is available through ParkVALET on Level 4 Departures near Terminal 1, Boarding Area C. International Garages A and G have standard and van accessible parking at all levels. In Long-Term Parking, accessible parking spaces for standard and van accessible vehicles are located on the first (ground) floor. SFO’s Long-Term Parking shuttle buses are wheelchair accessible. Travelers requiring wheelchair assistance are encouraged to advise their airline of their needs when making flight arrangements. Upon arriving at the airport, travelers with wheelchair or other special requests should approach an airline representative for assistance. At Domestic Terminals 1, 2, and 3, airline staff can be approached at curbside and check-in areas. At the International Terminal, please proceed to your airline’s assigned counter or dial 1-6210 from specially marked phones at all terminal entry doors. Arrangements for assistance to and from other locations at SFO can be made with your airline. Diabetes shouldn’t stop you from seeing the world! 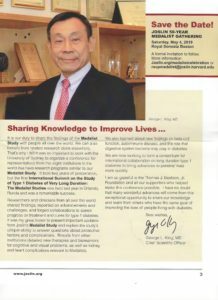 See: www.diabetesforecast.org for details. The last 25 years of my life, I have had to use a BASAL/24 Hour Long Acting Insulin along with a before Meal-Time/Fast Acting Insulin. This is most, but not inherently, due to wearing an insulin pump. The 35 years before that, I used syringes twice a day. I am dependent on insulin. I am an insulin addict. 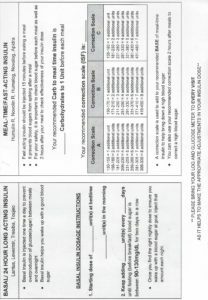 The following guide and charts will be of good use to you, the T1D and or T2Ds in need of insulin. Please use this with your doctor(s). 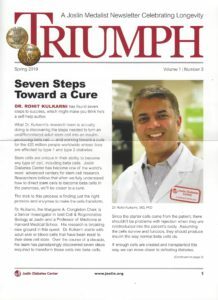 Posted on facebook February 15, 2019, “Judge Denies Insulin Makers’ Motion to Dismiss Class-Action Lawsuit Regarding Skyrocketing Insulin Prices,” this article is definitely worthy here at Buckroth’s Blog. “NEWARK, N.J. – Today, a federal judge’s opinion has greenlighted a national class-action lawsuit filed against Sanofi, Novo Nordisk and Eli Lilly for their systematic overpricing of insulin and concealment of a behind-the-scenes arrangement orchestrated to hike insulin prices, according to attorneys at Hagens Berman. “Hon. Brian R. Martinotti, U.S. District Judge for the District of New Jersey granted in part and denied in part the drug companies’ motion to dismiss the case. The opinion allows state law claims from plaintiffs – people living with diabetes who Eli Lilly, Sanofi and Novo Nordisk have forced to pay skyrocketing insulin prices – and gave attorneys representing them ability to address concerns regarding individual state representation. To the extent the court requires a patient from each state, attorneys say they can and will add clients to satisfy the court’s concerns. F”ind out more about the lawsuit and sign up. “The lawsuit states that in recent years, Sanofi, Novo Nordisk and Eli Lilly have raised the sticker or “benchmark” prices on their drugs by more than 150 percent. Some plaintiffs now pay almost $900 dollars per month just to obtain the drugs they need, according to the firm. “Hagens Berman filed the first-of-its-kind lawsuit in 2017, detailing several accounts from patients resorting to extreme measures to survive rising insulin prices, including starving themselves to control their blood sugars, under-dosing their insulin, and taking expired insulin. The complaint also detailed how class members having intentionally allowed themselves to slip into diabetic ketoacidosis – a potentially fatal blood syndrome caused by lack of insulin in the body – so that they can obtain insulin samples from hospital emergency rooms. “Steve Berman, managing partner and co-founder of Hagens Berman, was named co-lead counsel in the case by Judge Martinotti. “Are you Affected? Sign up for the Case Now. Attorneys are currently looking for those who purchased Lantus, Levemir, Novolog, Humalog Apidra, and/or Toujeo from the following states: Alaska, Alabama, Connecticut, Delaware, Hawaii, New Hampshire, North Carolina, North Dakota, Oklahoma, Rhode Island, South Carolina, South Dakota, Virginia, West Virginia or Wyoming. Sign up here. Did you purchase Humalog in Arkansas, Illinois, Kentucky, Mississippi, New Mexico, Oregon, Tennessee or Vermont? Sign up here. Did you purchase Novolog or Levemir in Colorado, Montana, Nevada, or Washington? Sign up here. Did you purchase Lantus, Apidra or Toujeo in Louisiana, Maine, Mississippi, Tennessee or Washington? Sign up here. 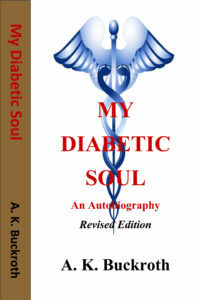 My Diabetic Soul – An Autobiography copyright 2010, remains a good read for those of you that have a copy. As it was originally published through an Indie Publisher, typos in this original version had not been addressed – until now. Only available for sale as an audio version, read by the author, your quick download via Audible.com is efficient. 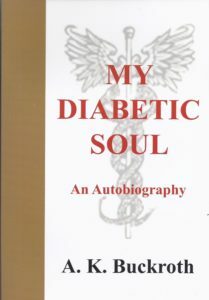 My Diabetic Soul – An Autobiography Revised Edition copyright 2018, has taken its place. Its plot and setting are not too different from the original. However, this book holds recent updates with diabetes care, has a delightfully useful Index along with Internet Reference Resources from research. This latest version not only has a bright, colorful title cover, it is crisper to read with available and comfortable inner space. It has been profesisonally copyedited and proofread. Shorter Chapters with new Titles increase clarity and voice through the story. It is also proudly included in the Library of Congress under #2018961888. After numerous months of efforts, it is available through Amazon.com in paperback and e-book formats. The Nook by Barnes & Noble carries the e-book format, of course. ISBN- 13; 9781492839682 and ISBN- 10; 149283968X; it is 324 pages, 45 Chapters, with photos. WASHINGTON —Today, U.S. Representative Bobby L. Rush (D-Ill.) introduced H.R.366, the Insulin Access for All Act of 2019. This bill, cosponsored by 33 members of the House Democratic Caucus, eliminates the cost sharing requirement under Medicare and Medicaid for insulin. This legislation was inspired by countless stories like that of Alec Raeshawn Smith, age 26, who died because he was forced to ration his insulin after he aged out of his parents’ insurance coverage. Stories like this are further proof that we must do something to lower prescription drug costs. “I am pleased to see that House Democrats’ agenda includes work on this vital and life-saving issue for the people,” said Rush. A study by The Lancet Diabetes & Endocrinology journal predicts that by 2030, 79 million adults with type 2 diabetes are expected to need insulin to manage their condition and if current levels of access remain, only half of them will be able to be able to get an adequate supply. “The bandage was wound around the wound. “The farm was cultivated to produce produce. “We must polish the Polish furniture shown at the store. “He could lead if he could get the lead out. “The soldier decided to desert his tasty dessert in the desert. “Since there is not time like the present, he thought it was time to present the present to his girlfriend. “A bass was painted on the head of the bass drum. “When shot at, the dove dove into the bushes. “I did not object to the object which he showed me. “The insurance was invalid for the invalid in his hospital bed. “There was a row among the oarsmen about who would row. “They were too close to the door to close it. “The buck does many things when the does (females) are present. “A seamstress and a sewer fell down into a sewer line. “To help with planting, the farmer taught his sow to sow. “The wind was too strong to wind the sail around the mast. “Upon seeing the tear in her painting, she shed a tear. “I had to subject the subject to a series of tests. “How can I intimate this to my most intimate friend. Found on the facebook page of English Professor June Gillam (JuneGillam.com), I needed to share this with you. Consider this a lesson for today!